There was a new Developer Diary released Tuesday on Freep rewards. Several months ago, Jared “Kelsan” Pruett, a developer in charge of PvMP in LOTRO, set up several feedback threads for Creeps and Freeps alike. One of the threads was on Freep rewards. All quests are now Dailies. All quests reward the player a combination of Destiny, Glory, and Coin. Quests to kill Tyrants or Chieftains now reward the player with Tyrant Crests and/or Chieftain Brooches on completion. Rewards for each quest can be more potent, i.e. more Crests per quest, as each quest can only be done once per day. Freeps HAVE to move around the map. To get all of the quests done, they will have to move, which means no farming (at least less farming). Freep consumable potency has been increased to be comparable to top tier crafted potions. Barter cost for consumables have been reduced & unified: all potions now cost 10 Dull Spirit Stones for a stack of 5. As I don’t want to see the Delving be completely abandoned all the time, this is okay with me, as that is a cheap cost and requires a minimal amount of PvE for a good stack of pots. I hope comparable costs are implemented on Creepside. “The following changes were made to the Ranger to help him fulfill his role on the battlefield; that of a single target assassin that focuses on key targets. This is really cool, as I like the Ranger (except when I am playing my Creep haha). I would like to see both the Ranger and the Troll playable more often. As was mentioned earlier, the PvMP armor sets are moving off of the Delving of Fror stones barter system and onto the Tyrant’s Crests and Chieftain’s Brooches system. The cost will be 20 Chieftain’s Brooches and 20 Tyrant’s Crests per piece. This means 120 of each total. That is a whole lot. Current armor sets will be barterable for the new armor sets, so the hard work players have been putting in isn’t wasted. The new armor sets will reflect itemization and stat changes though. There are some very sweet items available, including ring sets for hunters/burglars, champs/wardens/guards/captains, and lore-masters/runekeepers/minstrels. It was interesting though, Kelsan apparently didn’t get the memo on captains getting their primary stat changed to might, as he grouped the captains in with the tactical classes. The rings are not restricted by class, though, so captains will be able to use them. Some other items that were available were off-hand weapons for appropriate classes, shields for guards, minstrels, and wardens, a new captain banner that looks pretty much awesome, and a riffler for runekeepers that will clear movement speed debuffs with Prelude to Hope, which is very interesting. I actually got to see the cloaks in the Beta, and they are pretty awesome looking. I wish I had taken a screenshot. The cloaks will also be featuring a new technology that allows the stats to change based on rank. I imagine that technology will be implemented with other items too, as new updates roll in. Creeps have always had one purpose: to fight player-vs-player. That is why you play a Creep. Freeps, on the other hand, could PvE if they wanted to, but instead come to the Moors to try their skills on the ultimate enemy: human players. This was the only draw for a long time, and it was sufficient for most. There are some “rewards for PvP” available, such as armor sets (which require rank AND PvE in the Moors), jewelry (which require rank and PvE) and now special relics that enhance Freep skills (also gated behind rank and PvE). The number one complaint that Freeps and Creeps alike have about the Moors is the amount of PvE required for Freeps to get rewards. The Freeps don’t like it because it limits the amount of fun they can have ranking and PvP’ing. The Creeps don’t like it because it makes the Freeps sometimes avoid Creeps and go into the Delving of Fror for the Delving stones needed for the armor. This makes it hard for Creeps to have fun PvP’ing too. With the removal of Delving stones requirement, there will be more moving around the map, more PvP, which will be great. I am not fully convinced that the devs didn’t just give freeps more reason to farm Tyrants, but we will see. I am greatly looking forward to the changes, and I hope to see more freeps come out to meet the billions of reavers coming with the opening of PvMP to free players. My Captain, Ardaheru, hit 75 Monday night! I was 8th in Southern Cross to do it. It was a very interesting experience, and I wanted to share with you some screenshots and advice for a smooth experience. 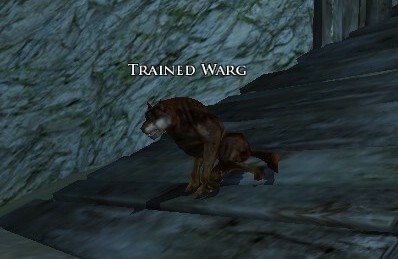 I found that wargs in Dunland are very well behaved. Saruman is a cheapskate though! 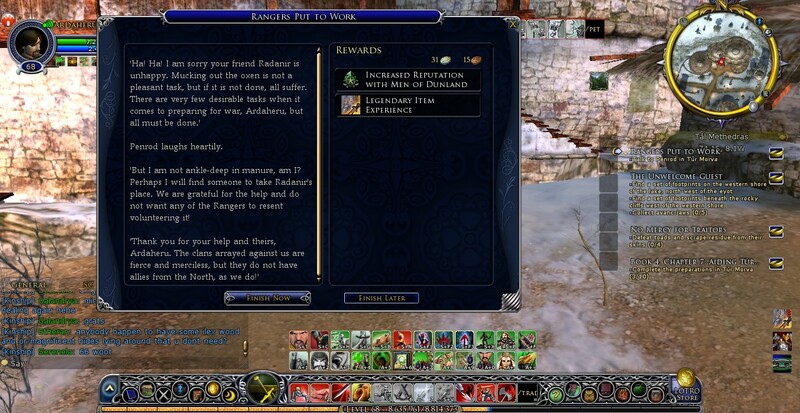 Here is the quest I was referring to in this post about humor and engagement in the Epic story in Dunland. "There are very few desirable tasks when it comes to preparing for war"
This is the second installment of How to Harness the HUD. Today’s topic is the Quickslots and Social Options. This will not cover keybinding the quickslots; that will follow in a later post. The quickslots page is primarily dedicated to display and placement of quickslot bars. Let’s talk about the quickslot bars first. TonicBars is a wonderful plugin for Lord of the Rings Online. I have recently been making full use of it on all of my characters. When it comes to things as simple as travel or as complicated as mid-fight weapon-swapping, it makes my life so much easier. Today there was more news of the Isengard expansion, and I am getting really excited! It was a preview released on PC Gamer by a guy called Josh Augustine. I would like to add my comments to a few selected sentences.